P.Oxy. 83.5345 has, since its excavation (probably in 1903), always belonged to the Egypt Exploration Fund/Egypt Exploration Society. In the early 1980s, Revel Coles assigned a preliminary date of 1st/2nd century to the fragment but did not identify it as Mark. The EES knew in 2016 that P.Oxy. 83.5345 was the alleged “first-century Mark” and prioritised publication to get it out as soon as possible. Both the EES and Dirk Obbink claim to have no knowledge of Dan Wallace’s NDA, nor have they ever seen it. The EES doesn’t use NDAs when it comes to publishing papyri. Dirk Obbink did show the fragment to Scott Carroll, but to no one else except some Oxford Students. The Non-Disclosure Agreement (NDA) that prevented Dan Wallace from talking about the fragment is not from the EES (note: Wallace confirms; see below). One thing I find interesting is that the EES knew about all of this in 2016. One thing I find very interesting is that even the EES admits that the Greens paid Dirk Obbink for something. I will add that although I do not know the ins and outs of the Green Scholars Initiative (which became the Museum of the Bible Scholars Initiative), I was once a student on a GSI/MOTBSI project, and I do not think that the regular mentors were paid. I could be wrong, but I never got that impression. It seems to me that merely being a part of the GSI/MOTBSI is not enough to account for why the Greens would have paid Dirk Obbink for anything (contrary to what this person argued). Then, just as the dust was starting to settle, Dan Wallace tagged back in. In his post, Wallace raises some great questions about the timeline according to the EES. Additionally, Wallace confirmed that his NDA was with not with them at all but rather with Jerry Pattengale. I think that confirms the Greens/Museum of the Bible as the potential buyers. [Note: there is a technical distinction between the Green Collection and the Museum of the Bible Collection, so it is still a bit unclear of the two collections precisely which one the potential buyer was.] Wallace still has a copy of the NDA and the email that explains it. Also, Wallace signed the NDA because the seller requested it. The seller requested the NDA? Let’s get that straight. Wallace’s NDA was the request of the seller. We can reasonably assume that the Greens/MOTB were attempting to buy it. But the seller, not the MOTB, is ultimately who requested the NDA. From his post, it is unclear whether Wallace knows who the seller was, even though most people are starting to see a trail of breadcrumbs that go back to Christ Church, Oxford. Still, if the seller is requesting a NDA, then it is the seller who doesn’t want people knowing about this fragment, right? Is it a stretch to ask more specifically whether it was the sale of the fragment that the seller doesn’t want anyone finding out about? This new revelation that the NDA was signed at the request of the seller potentially opens up a huge can of worms. We know that the MOTB uses NDAs, so one thing I am curious about is whether any other MOTB NDAs were signed at the request of a (this?) seller (and how many?). Is the use of NDAs for manuscript publication something that the MOTB learned from this seller? Also, Wallace writes, “I was told that the condition of the sale was that the seller of the manuscript would be free to choose who would edit it.” How often does that happen? It seems that the seller must be 1. Someone who is competent enough in papyrology to decide who should edit the earliest-known fragment of Mark’s Gospel (I’m not accusing anyone of anything, but an editor of Oxyrhynchus volumes would fit the bill) and 2. Someone whom the buyer(s) trust enough to be competent to make that decision (again, not accusing anyone, but the EES themselves admitted that Obbink did “receive some payments from the Green Collection for advice on other matters”). It seems to me that we have a he said/she said situation with a possible resolution. Some claim that the fragment was never for sale. Others claim that it was. If Wallace still has a copy of the NDA, then it looks like there is a paper trail that could vindicate him. If this were poker, it looks like Wallace is all in and starting to put his cards on the table. Who is bluffing? Will the others fold, or will they show their hands? What could be still to come? We still have not had any official statements from the Greens/Museum of the Bible or anyone who works for them. Given that Evans is one of the people who popularized the myth of the first-century Mark (including details about mummy masks and carbon dating that we now know to be incorrect), we would hope that he might take a page from Dan Wallace’s book and say something about the misinformation he spread (though I’m sure unintentionally and with the best of motives), but he maintains that his Facebook statement is enough. Still no word from Gary Habermas, either (to my knowledge). Dirk Obbink has been silent as well. He seems to have spoken to Candida Moss and Joel Baden, if only briefly. He must have spoken to the EES as well, according to their statement. He didn’t return my emails though, and I haven’t seen him making any statement anywhere else. I’ll add as a final word that we do not know why any of the parties involved are speaking up or staying silent. It could be that some are not saying anything because they do not want to dig themselves deeper holes, but silence could be a number of other reasons. We do not know the end game here, so it is always possible that some parties are silent for [good and commendable] reasons we do not currently know. More than anything, silence from some of those involved make me appreciate Dan Wallace (and likewise the EES) even more for having the integrity to make statements, clear the air and own up to past failures. That is nothing short of praiseworthy, in my opinion. This is beginning to sound like a Dan Brown novel. But we still don't know how Pope Benedict's resignation and the discovery of the Higg's boson are related to ��137. The Higgs boson is too technical to get into here, but as for the resignation, years ago in Tübingen, after Hegel....Wait, there's a knock at the door. Craig Evans?? I think it's safe to say that Craig Evans has never really been in the loop about P137 any more than any other reader of Dan Wallace's blog-comments and debate-transcripts. He really needs to admit that he has resorted to sensationalism, and resolve to dial down that sort of thing in the future. Confession is good for the credibility. This is not entirely true. He knew this spring, before the official pub. date of P.Oxy. 83, because i mention it article submitted to him. I had asked an old Oxon. friend about this papyrus, who confirmed my suspicions, and in responding asked me not to bruit it about until the volume appeared. I asked the same of Dr. Evans, and he obliged me. Elijah has nailed it. All the bread crumbs go back to Obbink. Now, basically, given all the accumulated evidence, Obbink is probably in trouble- or supposed to be in trouble. It doesn’t take a rocket scientist to figure out that HE demanded a NDA to cover his track, making sure the EES won’t find out he secretly sold FCM to the Greens. If the Greens decide not to make a public statement and we are left with what has come to light until today, then the reasonable person will give the benefit of the doubt to Wallace and conclude the Obbink has acted inappropriately. Obbink may have acted inappropriately, certainly if he falsely led Scott Carroll to believe P137 was for sale, but I don't think that would fully explain the level of false hype that surrounded this text fragment generated by apologists who tried to promote its importance much beyond scholarly prudence. My suspicion is that Carol heard what he wanted to hear in his discussions with Obink. Consider that there was purportedly, some talk of it appearing in the vatican. IF Caroll was hinting around for the Greens to buy the fragment, then its reasonable to assume he misread the situation. It's a bit curious that both worked for the greens and yet theres this weird back and forth about a sale. So here is a situation in which, apparently, a reputed papyrologist from the most prestigious university in the world, trying to sell a newsworthy manuscript fragment he obtained from a professional archeological society, to a business organization with notorious intentions (at least from a secular point of view) through an antique collector with a shady character and trying to generate hype about this whole deal through a bunch of religious sensationalists. And everyone else came to know about this scam just because of the religious interests of the apologists….. I think this whole manuscript /dating / research business should be under suspicion. Who knows what had happened in the past? After all, researchers in this field is operating under a veil of secrecy as we are observing now, only a few specialists in the field is directly accessing these manuscripts, monetary interests are involved, black market have a role to play, and papyrus fragments such as these are never dated through any reliable scientific method. I think governments should involve more actively in this matter and ensure that these treasures of humanity from our cultural past is handled responsibly. Mind you, Oxford is *not* the most prestigious university in the world. It's just one of those facts of life. It just thinks it is. Much of Cambridge campus is beautiful. While we wait for someone who knows--and some do (hello)--to tell us who identified Mark, and who the attempted/alleged/putative/whatnot seller is, a couple inklings about the single fragment. If it was described and photographed in the early 1980s, then it seems safe to say it is an ancient pOxy. Yet might the claim that no unpublished bits remaining are Christian and that early be a premature assertion? Out of so many thousands of bits, how likely is it that only this--and from page one at that--survived? Possible, but probable? By comparison, one of the reasons so many Dead Sea Scroll Biblical fragments sold after c. 2002 were recognized as fake (cf. Dead Sea Discoveries 2017 no. 2) is that none (maybe) matched any yet-published better-provenanced Qumran mss. Maybe one thing to look for is another small bit of Mark? While trying to hide his involvement in this scam Craig Evans is selling his next product in the apologetics industry "Fragments of Truth". More apt name considering his lost credibility in this are is "Fragments of Lies"
really, a cat gif? in ETC blog? Didn’t you tell us to blog about our cats a few years ago? It's called paratext. Very interesting for those interested in reception-history. Just to be clear, unrelated unicorn pictures are acceptable, but cat gifs aren't? I think you need to add "cat gif" in your tags to this post. Hold on, do we know that cat is not the seller? I do not think that the cat is the seller. But he unicorn indeed is of interest for NT science. It is possible that Saint Luke is the inventor of that picture. As a painter (of Saint Mary's portrait) Saint Luke possibly designed the unicorn as a type of Christ to be added to Mark's gospel. With the unicorn and the Virgin's portrait Saint Luke added in the form of images the history of the annunciation to Mark's Gospel. So: the unicorn is Lukan "Sondergut" in Mark. 1) If the situation is as Dr. Wallace claims, that the seller requested that Wallace consent to an NDA in order to see the manuscript, wouldn't we expect the NDA to have been between the seller and Dr. Wallace, as opposed to the purchaser and Dr. Wallace? Wallace writes in his update: "Pattengale relayed to me that the reason for me signing the NDA was that it was requested by the seller…" So Pattengale is “relaying” all of this to Wallace, and Wallace is simply taking Pattengale’s word for it. It doesn’t appear that Wallace ever actually communicated with this alleged “seller.” Nor is it clear that Wallace even knew the identity of the alleged seller at the time. He doesn’t say. Again, Wallace appears to have taken the word of Pattengale that the papyrus was for sale, but it does not appear that he actually knew that to be true, regardless of what he had heard. 2) Wouldn't we also expect Pattengale/Green collection to have been under an NDA with the seller? It would make little sense to allow a potential purchaser (Pattengale/Green) to remain free to disclose anything and everything about the MS, but at the same time force their consultant (Wallace), who only saw the papyrus for a "few minutes" apparently, to be locked down by an NDA. That doesn't make any sense to me. 3) If the Pattengale/Green group was in fact under an NDA with the seller (Obbink is implicated), which would almost certainly be the case if Wallace were under an NDA at the seller’s request, why wasn’t Scott Carroll also under an NDA with Obbink? After all, EES and Carroll both confirmed that Carroll was shown the manuscript by Obbink, and yet Carroll continued to quite publicly discuss FCM over the years, even naming Obbink as the most important person involved with the publication during his interview with Josh McDowell in 2015. In the same interview, Carroll stated: ”There were some delays with its purchase and I was working at that time with the Green family collection which I had the privilege of organizing and putting together for the Hobby Lobby family and had hoped that they would at that time acquire it. But they delayed and didn’t.” Carroll certainly didn’t behave as though he were under an NDA. This is consistent with EES’ claim that neither they nor Obbink ever knew anything about any NDAs. However, recall that Wallace claimed his NDA to be so restrictive that he could not even acknowledge the existence of the manuscript. Therefore, it would seem that the restrictions placed on Wallace came from Pattengale/Green collection, not from the alleged seller (Obbink). Otherwise, we would expect Carroll to have been just as silent about the matter as Wallace had been. 4) Perhaps it is the case that the manuscript was never offered for sale, but that the Green collection intended to acquire it anyway. Wallace writes in his update: “Why would I be asked by the potential purchaser to evaluate the content and date of the fragment if the document was never for sale?” Well, he might have been asked to evaluate those things if the Green collection were trying to assess the worth of the papyrus before making an offer. And a reason the Pattengale/Green collection might lie about the manuscript being offered for sale is because they didn’t want Wallace to know they were involved in what would ultimately be a very shady acquisition. They knew the means of acquisition would not have been legitimate, i.e. they knew Obbink had access to the fragment; but they must have also known that he was not its rightful owner and would not have had the authority to sell it. 5) In the end, of course, the question of provenance with respect to prior ownership would not have been much of a problem for the Green collection, given their typical “it’s ours now” attitude. They’ve never seemed to be terribly concerned about disclosing the full provenance of their artifacts. And who knew "to palimpsest" can be used as a verb? EES is curiously quiet after Wallace's most recent post. They still haven't accounted for several holes in the narrative. For example, how did Wallace see pictures of P137 (P.Oxy5345), and for what reason, if only Carroll and a few Oxford students saw it. This sounds like a pretty good explanation to me. At least it fits well with the shady working methods of the Green collection in those days. Sorry my above comment was related to JoshuaJ's comment. Wallace also writes in his updated statement: "I signed the NDA in early October 2012; I still possess my copy of it along with the email it was attached to—an email that explicitly speaks of the purchase as the reason for the NDA." So I have to wonder if Wallace is asking in earnest in his most recent statement why the publication took so long. Most of this seems like nonsense to me. Wallace had every opportunity to acknowledge the process was extraordinarily slow in this case, and yet he chose to explain it away instead. In your opinion, why did Wallace try to defend/explain away the prolonged publication timeline in that interview? Something else I haven’t seen a good explanation for is how Obbink could possibly have gotten away with selling such an important manuscript that didn’t actually belong to him—one he was not even authorized to sell, apparently. There’s no way he could have sold it without EES finding out. Everyone in Oxford would have known. The fragment had already been discovered and identified as Mark in 2011 by a “researcher” working with Obbink, and Oxford students (perhaps many?) had already seen the ms and knew it was in Obbink’s possession. Had Obbink actually sold the fragment, the trail would have immediately gone right back to Obbink. I mean, what was his endgame, here? Sell it and then go into hiding? I just don’t see how Obbink could have offered the papyrus for sale without EES also being in on the sale. And if they were in fact in on the sale, why would they now lie and say it was never for sale? "Oxford students (perhaps many?) had already seen the ms and knew it was in Obbink’s possession"
Who are these "Oxford students" and how come none have said a word, either in 2011 or at any time since? That's a very good question, one that I too would like to have answered, along with the identity of the "researcher" who identified the fragment. Another question I would love to have answered is who was the first mystery representative of the Green collection who initially gave Wallace the wrong dating knowing full well the information he was feeding Wallace was false? According to Wallace, it wasn't Pattengale. And Carroll denies being involved. So who was this mystery Green rep, and what was his purpose in encouraging Wallace to disclose things the rep already knew were false? Why won't Wallace tell us who this representative is? Another question I would love to have answered: Why wasn't Scott Carroll under a nondisclosure agreement? Why would Wallace have been required to enter into an NDA, but not Carroll, who had not only seen the papyrus, but was actually offered it for sale? I think there are a couple of possibilities. Part of the EES statement said: " In spring 2016, in the light of the social media debate about possible early fragments of gospels being for sale, the EES decided to review what NT fragments had been identified in its collection but not yet published, and realised that the supposed first-century Mark was the papyrus now published as 5345." I would infer from this that the EES were suspicious in 2016 that Oxy mss were involved in the speculation (presumably through Obbink's involvement). The EES haven't ever denied that a sale was proposed officially to the Trustees, discussed, and rejected. They have simply said that the papyrus was not for sale. There seems to be three possibilities: a) Obbink wondered whether a sale could be approved by the EES ($1 million for a small fragment would fund lots of research, and he might get a percentage as intermediary). This was considered, but not approved. Hence no sale, publication in the POxy volumes. b) Obbink had a variety of papyri from a variety of sources on his pool table. Some were for sale (and presumably were purchased, e.g. the Green Collection Sappho papyrus which is related to the one that Obbink published, perhaps some of the other Green Collection NT papyri). Americans tend to think that everything is for sale at the right price, so misunderstood the situation with the FCM papyrus. c) Obbink did think he could cover up the theft of the FCM from the Oxy archives, and offered it for sale on that basis. But later on either decided not to do that, didn't get the money he wanted, or thought he probably wouldn't get away with it. I'm not convinced by possibility A and B. Both seem unlikely, given what we know from Wallace. Regarding B, Wallace received an NDA via an email at the request of the seller. Later he was asked to examine the fragment for the purpose of its sale. At that time, Wallace saw pictures of P.Oxy.5345. Let's assume there was original confusion about which papyri were for sale. This doesn't explain why Wallace was shown pictures of P.Oxy5345. If P.Oxy.5345 wasn't for sale, then how did Wallace see pictures of it? Why would Obbink distribute pictures of P.Oxy.5345 if not to sell it? ESS still hasn't explained how Wallace ended up seeing photos of it. This is one gap in their statement. Regarding option A, if a legitimate sale of an Oxyrhynchus text was being floated, why was its provenance so secret? Why the NDA? Why wasn't Wallace told that it was from Oxyrhynchus? It seems that informing Wallace of its provenance would be valuable information if you want his expertise. Yet Wallace was completely unaware that it came from Oxyrhynchus. Oddly, though, Wallace was told that it came from Egypt. All good questions. But don't forget to question the assumptions as well. Photos could possibly have been taken by any of several people and could possibly have been "distributed" by someone other than Obbink. Such as whom? Are any of these more probable than Obbink? Such as a student or researcher, a possibility that may need not be more assuredly probable to be noted, to question an assumption. Would an NDA be written and signed if option a is what happened? Certainly possibilities can be noted, but if the possibilities are unlikely, they do little - if anything - to challenge the assumption. They effectively have no traction. For example, it seems far-fetched to surmise that Greens/MOTB mistakenly assumed that P.Oxy.5345 was for sale, and subsequently, obtained of photo of it through a student. 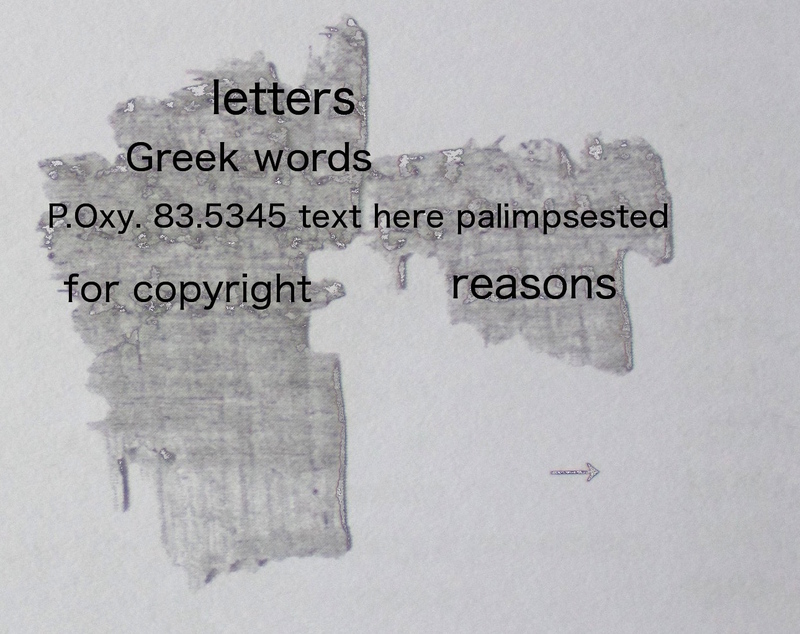 I would be surprised if students are allowed to photograph unpublished Oxyrhynchus papyri, especially this one. Also, this scenario would be an extremely circuitous route, considering that: 1) Pattengale and Obbink have a documented and direct relationship, and 2) that Obbink was the senior scholar for the Green Scholars Initiative. If MOTB/Greens thought P.Oxy5345 was for sale, even if mistakenly, it makes more sense that they would ask Obbink for photos to show Wallace, not a student. The bottom line is that EES still hasn't provided an explanation of how Wallace was able to view photos of P.Oxy5345. It's a hole in the narrative and leaves room for suspicion. But Obbink said he did not show it to Wallace? And someone did something not allowed? In a link to a photo (provided by Brent Nongbri at his blog) there's D. Obbink in an office with mummy masks, and behind a mummy mask stand, a green stripe that may be the edge bumper of a pool table. Prof. Christopher P. Jones has recently posted comments, "Some thoughts on P.Oxy LXXXIII 5345 (P. 137)"
Dr Head, I’ve heard a rumour that you’ve done some work for the Museum of the Bible. Correct? 1. Wallace account is very clear that the persons claiming to be the sellers were not Obbink. In particular this is implicit in his discovery (somewhere along the line) that the persons who were representing the sellers had misrpresented Obbink's views on dating. The most likely explanation for Wallace's NDA is simply as a device to shut him up - as he says, he has no expertise at papyrology. But would be unlikely to forgo an opportunity to see a photo of the precious FCM, and once there he would be hooked (as indeed he was). 2. The infamous recorded conversation with Scott Carroll that circulated a year or so back made two specific statements in respect of Dirk Obbink in 2011 and 2012; that he was acting in support of a sale of the fragment, and that he supported a first century date for the fragment. Obbink disputes both of these. While a (theoretical) 'Bad Obbink' might be lying about the first statement, he could not be lying about the second; we have seen the photos, and there is no way a respected papyrologist would maintain a first century date for the fragment. So if we know that the one statement is false, likely the other is too. 3. Then there is the tricky question of the unnamed (and likely disaffected) researcher whose discovery in 2011 that P137 came from Mark made all this possible. A thriller setting out the career of a theoretical 'Bad Obbink' could contrive that he discover the nature of the text (and hence vastly increase its value) himself. Then a bit of prestidigitation might allow Bad Obbink to obtain another papyrus fragment from some distant box in the collection, and substitute it for P137, which he could then sell. But factor in the 'researcher' and this becomes much more difficult - and if Bad Obbink were maintaining a 1st century date for P137, keeping the researcher out of the loop would be impossible. All-in-all Bad Obbink is not a credible narrative. Much more likely that the same people who Wallace now knows were lying to him in February 2012, were lying all along.